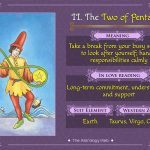 The Four of Swords is a card that belongs to the fourth suit (Swords) of the fifty-six cards called Minor Arcana in a traditional seventy-eight tarot card deck. The card is used for both playing and divination, and its suit element is air. 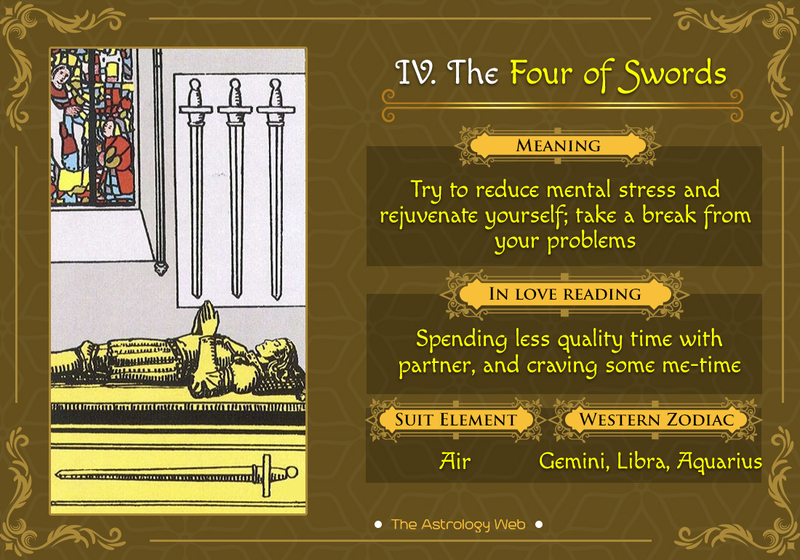 The Four of Swords Tarot card shows a knight/warrior lying on tomb placed in the basement of a church. He is folding his hands in a praying position, describing his last few hours before death. On the right, there are three swords on the wall hanging above him pointing downwards while the fourth one lies beneath the tomb in a horizontal position. To the left, a stained glass window can be seen, depicting a woman and a child. 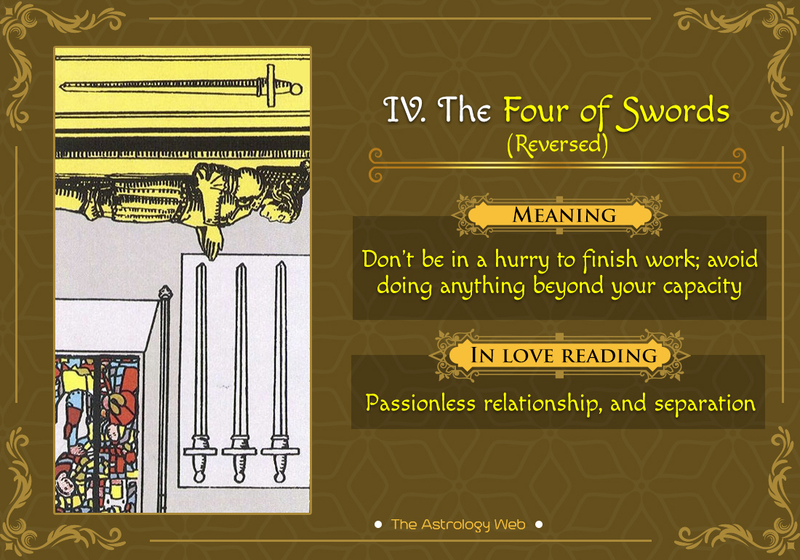 The 4 of Swords symbolizes a period of relaxation and rest after overcoming challenges and difficulties in life. The knight is a representation of rejuvenation and recovery from pain. The tomb stands for a resting place where one can feel free from any pain or grief. 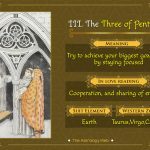 The three swords reflect the pain and sufferings once has endured while the fourth sword signifies the settlement of past conflicts with no heaviness in the heart. The woman and child in the stained glass window depict the birth of new ideas and opportunities after a period of recovery. It refers to someone who is calm, quiet, non-violent, and soft-spoken. Getting along with others and making new friends are easy for such people due to their peace-loving nature. They believe in simple living and high thinking. In your life, this person will come across as highly spiritual and thoughtful. You may feel balanced and tranquil at this moment, demanding a quiet place where you can think deeply. 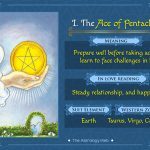 A feeling of detachment may arise since the card is about taking a long break from worldly affairs. It suggests you be a bit more involved in your daily activities rather than just relaxing and contemplating about your life. Don’t remain aloof from the important events otherwise, you will regret later. Interpretation: In this position, it indicates that you are taking some time off from the challenges and struggles going on in your life, promising to make a comeback. During the resting phase, you might be practicing ways to calm your mind so that you muster enough strength and fight back when in action. 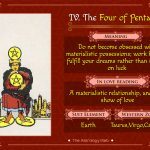 The card indirectly stresses the need to lessen mental stress and tension and thereby become resilient towards any crisis. Therefore, you should stop worrying and take a backseat for a while before hitting back. Interpretation: If you are in a relationship, you may not be able to give enough time to your partner. However, your need for some alone time can cause a misunderstanding and affect the liaison. It would be advisable to sort out the issues before its too late. If you are single, you might not feel the desire to spend time with someone as you are happy with yourself. Career and Work: Due to a mental overload, you might reach the threshold level of breaking down. Speak to your superiors and take a break from the nine to 5 routine. Business and Finance: In the financial realm, you are facing the undue pressure of paying off loans, handling multiple investments, and building a nest egg. If you can unload the burden from your head, you will feel lighter. Health: If you already have some anxiety-related issues, they may burgeon in the absence of any proper medical professional help. Interpretation: In the upside-down position, you can are feeling restless, trying your level best to finish all the tasks assigned. Despite the fact that relaxation and ample rest is necessary, you are pushing yourself beyond the limits to get quick results. Running from here to there, accomplishing your work will lead to a major burn-out. Before the situation gets out of control, pause and rest. Interpretation: Undue stress and anxiety are taking a toll on your relationship. If you need emotional support, have a proper discussion with your partner. Career and Work: After a long break from work, you are finally returning to your routine office life with new enthusiasm and aspiration. As you have learned the coping techniques, it would not be difficult to manage the pressure and deadlines. Business and Finance: You can feel relieved now since your financial conditions are taking a positive turn. After a rough phase, you will feel overwhelmed handling the money flow. Health: Expect quick recovery from a long-term illness if you have been patient and strong till now. Past: In your former years, your obsession with something thing or person was so strong that affected your life greatly either in a negative way. However, you have recovered and transformed into a strong person. Present: You want to withdraw yourself from social circles and concentrate on your welfare. The card also suggests the same so as to attain some peace of mind. Future: You are planning way ahead of the future by working like a machine to achieve your goals. Just relax and think of useful strategies that will help to work smartly.